In order to better monitor and understand OSM mapping and data quality, HeiGIT developed a software platform (ohsome.org) that applies big data technology to OSM full history data. OSM full history analysis allows detailed investigation of OSM data evolution and the detection of patterns over time. A new paper accepted for ISCRAM 2018 conference illustrates the specific potential of the ohsome platform for disaster activations by means of two relevant case studies, i.e. the Nepal 2015 earthquake and a comparative evaluation of activations by the Humanitarian OpenStreetMap Team (HOT). Initial results show that the flexible and scalable platform enables fast and easy information extraction related to mapping processes that support mapping processes and data quality assurance. 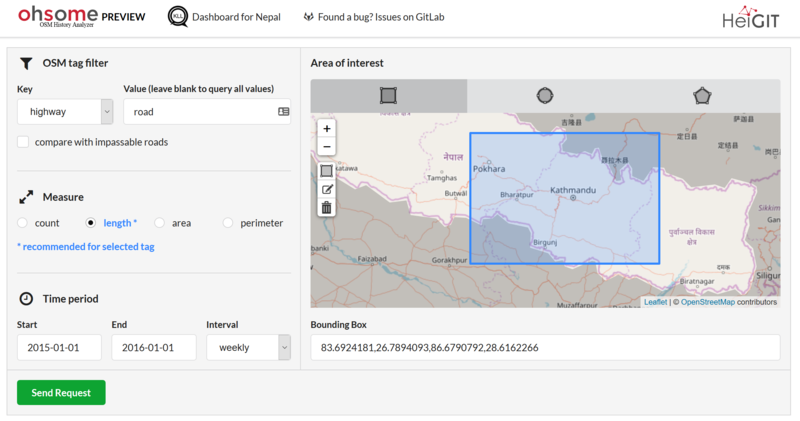 Currently HeiGIT/GIScience Heidelberg and KLL are also working together to develop an OSM analytics dashboard on OSM history analysis for better understanding the situation with resepct to OSM data quality and it’s evolution in Nepal. Stay tuned for more information about the results at the 15th International Conference on Information Systems for Crisis Response and Management (ISCRAM) in Rochester, NY, US. Looking forward to see you there! Auer, M.; Eckle, M.; Fendrich, S.; Griesbaum, L.; Kowatsch, F.; Marx, S.; Raifer, M.; Schott, M.; Troilo, R.; Zipf, A. (2018 accepted): Towards Using the Potential of OpenStreetMap History for Disaster Activation Monitoring. ISCRAM 2018. Rochester. NY. US.